16 Sep :The President of India, Smt. Pratibha Devisingh Patil inaugurated the two-day Conference of Governors at Rashtrapati Bhavan today. 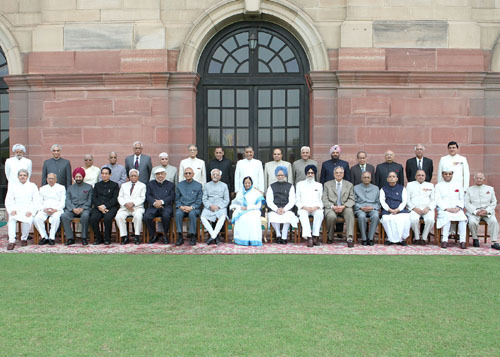 This is the 42nd Conference to be held at Rashtrapati Bhavan and the first Conference to be presided over by Smt. Patil. 28 Governors and three Lt. Governors of the States and Union Territories are attending the Conference. The Vice-President, the Prime Minister and several Union Ministers are also participating. In her inaugural address, the President covered a wide range of issues. She said the big challenge facing the nation is the battle against terrorism, Left Wing Extremism and insurgency. Intervention by trans-border elements also poses a threat to the country’s security and integrity. Referring to the serial blasts in New Delhi on 13th September, Smt. Patil said metro-terrorism has given a new dimension to subversive activities and is a matter that calls for innovative action to prevent its recurrence. In this regard she highlighted the need to modernize the police force. The President also said there is need for an institutional mechanism to seamlessly share actionable intelligence on real-time basis. Emphasising that violence has no place in democracy, the President said consensus building is integral to nation building. Turning to the agriculture sector the President mentioned that since food security is crucial for the nation, food availability with right nutrition content and assured accessibility has to occupy centre-stage in the country’s economic activity. While respecting traditional wisdom, adoption of new innovative farming practices is also necessary, she said. Harmonization of ecological and environmental imperatives with development strategies is also necessary she urged. The President urged the Governors to lend their stature and intellect to convince the people that the phenomenon of Global Warming is actually occurring and mobilize support towards sustainable development. Expressing her sympathy and solidarity for the people of Bihar in braving the devastation caused by the Kosi River, Smt. Patil said the time has come to go beyond the post-disaster management approach and instead emphasize on prevention, mitigation and risk-reduction approach. On education, the President said that, the higher educational institutions must emphasize on experimentation and innovation. She also called upon the Governors as Chancellors, to use their sagacious counsel to guide the State Universities. Referring to women, the President said inspite of being 48 percent of the population, they continue to suffer from discrimination, disparity, indignity and exclusion from decision-making processes. Smt. Patil strongly stressed the urgent need to constantly focus attention on women’s empowerment and elimination of social evils as they retard the progress of both society and nation. She said, any agenda for empowerment of women should cover gender needs at every stage of life beginning from protection in the womb by prohibiting female foeticide, checking female mortality through better nutrition, addressing gender preferences in families, giving equal educational opportunities to the girl child, making them economically independent by imparting skills, making work-places safe for women, building defence against domestic violence and allowing women to fully realize their capacities. Special attention needs to be given to Gender Budgeting, the President stressed. There is a need to bring about the right modicum of convergence between various government schemes for women so as to make the cause of women’s development a collective concern. Referring to the Scheduled Castes, the President said they must be able to lead their lives with dignity and honour, free from atrocities. On the Scheduled Tribes, the President said there is a feeling in certain quarters that the Governors should play a pro-active role, with regard to exercise of their powers under the 5th Schedule of the Constitution. On the other hand, court judgments and debates in the Constituent Assembly provide that the Governor is bound by the advice of the Council of Ministers in this regard. The President suggested that the Government could seek authoritative legal opinion to set at rest this ambiguity. Mentioning ex-servicemen, Smt. Patil said special care must be taken for their welfare and rehabilitation. She urged the Governors to hold regular meetings and impart greater dynamism to these Boards. The Governors and Lt. Governors briefed the participants about various issues with regard to their States and Union Territories such as the internal security environment, border management issues, challenges of climate change and sustainable development, food security, promotion of gender equality and implementation of programmes for women’s empowerment, administration of Scheduled Areas and Tribal Areas under the 5th Schedule, administration of schemes for ex-servicemen and war widows, higher education, the flooding in Bihar caused by the Kosi River and flood management, agricultural reforms, fragmentation of land holdings, cyber crimes, narco trade and drug abuse and its social consequences, forward looking rehabilitation policy for those whose lands have been acquired for industrial purposes and effective land acquisition policy and communal violence. The Minister for Home Affairs, Shri Shivraj Patil gave a brief assessment about the internal security scenario across various parts of the country. He also spoke about the challenges in tackling naxal violence and communal violence. Shri Patil also spoke about land border management and coastal security issues as well as the rural-urban security situation with extremists concentrating more on the big cities. The Minister also spoke about the urgent need for modernization of police forces and setting-up of more police stations in the states. Earlier, yesterday evening the informal conference of Governors at Rashtrapati Bhavan chaired by the Doyen of Governors, Shri D.N. Sahaya, the Governor of Tripura, expressed its profound shock and grief over the loss of innocent lives in bomb blasts in New Delhi on September 13th. The informal Governors’ conference also condemned this dastardly and heinous act of the terrorists and extended heartfelt sympathies to the members of the bereaved families.